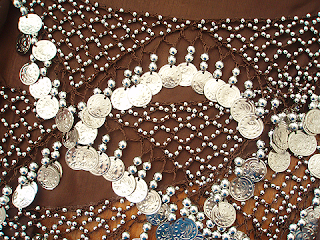 I thought you might like to see the coin hip scarves Dotter and I wear for our belly dancing class... which is still utterly brilliant! Today I cast on a Three Tams birthday gift for someone... they can't wear wool, and I'm not sure about other natural fibres, so for the first time in years I'm knitting with 100% acrylic. This is the brand new Smoothie DK by Patons, and I must say it's really lovely - it feels close to a cotton / bamboo blend, and has a beautiful sheen. 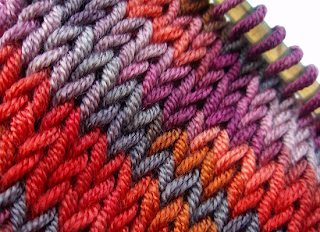 The yarn is 6 strands quite tightly twisted, a bit like one of those amazing Italian yarns. The 100g balls are really well priced too, only about $4.50 each. Main problem is it's a bit splitty, similar to the Lincraft Bamboozle. I'm only 3 rows into the Tam here .... so pretty! Ok, now we need video of bleey dancing. The tam will be so pretty. Love the colors. There's nothing like a coin scarf for making you feel like your hips are good for something! 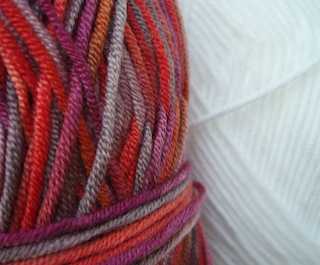 Love that yarn, I wonder if they sell it in the US. What pretty jingly scarves. Work those hips! And we need a photo of the finished tam. It looks lovely so far! 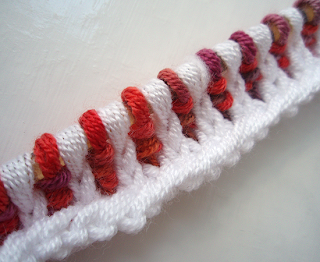 That's a very pretty yarn and pattern. 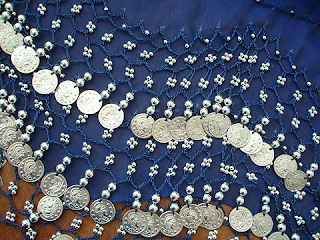 The coin belly-dancing wear looks jaunty-jingly! Fun! I love the coin scarves. They look like such fun. I made some small things for my niece with Caron Simply Soft which is 100 percent acrylic (and therefore very washable for my handwashing averse sister in law). It was so soft and the colors were brilliant and beautiful. It wasn't so bad actually. I feel almost sacrilegious saying this, but that acrylic is very pretty! Coin scarves - love them! If you didnt tell anyone, I wouldnt have picked that as acrylic by looking at it. The Smoothie certainly felt above average in the ack stakes. The colours are great! my coin scarf is like the top one except in black with silver. Which one is whose? Love the gorgeous hip scarves: I can almost hear them!! The Tam looks great, and it looks even greater when you've knitted more later on!!! !